Israel’s blockage of fire and rescue crews increased the amount of fire damage at Jenin. (JENIN, West Bank) – Palestinian sources reported Thursday that after several storehouses for households and sponge products caught on fire, the Israeli army obstructed Palestinian firefighters and rescue teams from reaching the area; an issue that increased the damage and losses. The storehouses that belong to merchants Omar Fathi Amour and Khaled Al Nabulsy, are located in Barta’a village surrounded by the Annexation Wall near the northern West Bank city of Jenin. Majdi Qabha, head of the Barta’a Village Council, stated that the residents rushed to the scene and managed, later on, to put the fire off, but as firefighters were not allowed through, the losses were estimated by 1 Million NIS. Qabha added that the residents initially called Israeli firefighters as the station is close to the village but the Israeli army prevented them from crossing into the Palestinian village. 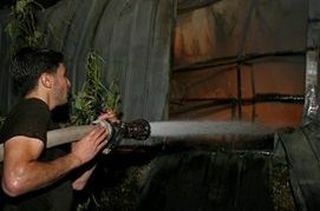 Later on, Palestinian firefighters were informed of the fire who rushed to the scene and managed to control the fire.